Cool! Now I get to add bag designer to my art resume! As you can tell, today’s creation involved tangling on fabric. Similar to yesterday’s post, this creation required a little forethought before diving in. First off, I needed some fabric to tangle on, so I headed over to my local craft store to scope out what my choices were. 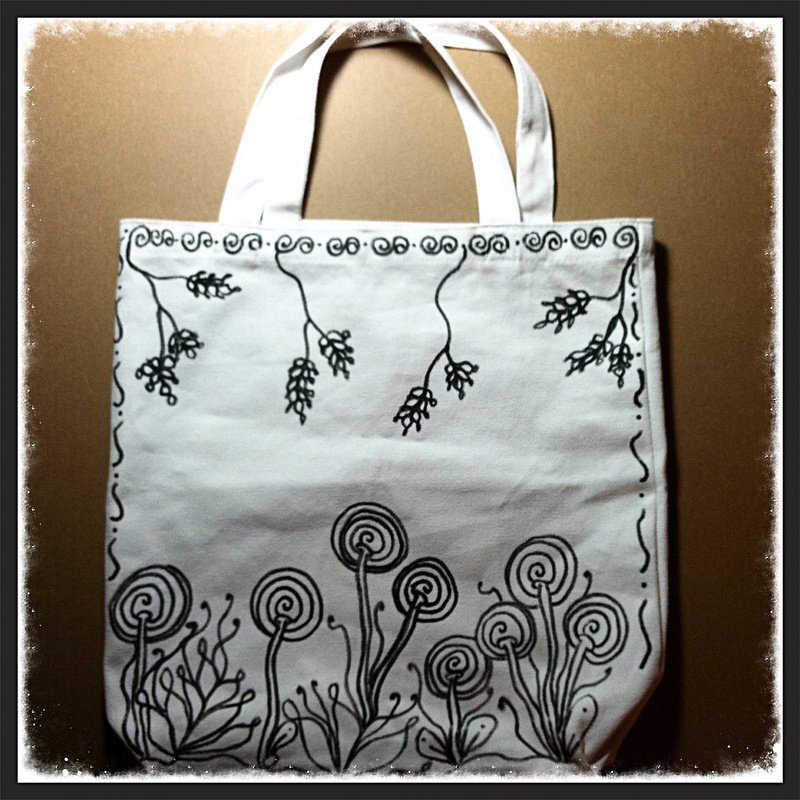 I landed on a cute basic white canvas bag which I thought would be perfect to tangle on. Second, I needed something that would easily draw onto the fabric and also be washable. After looking around the fabric section, I picked out a black permanent marker that was design to go right onto the fabric. How awesome is that? Now I was ready to roll! Now here is where the risky part came in. Now that I had my choice of fabric and the means to draw on it, the hardest part is deciding to begin. What if I screw it up? What if my cool new marker leaks all over the place and ruins the project? The what–if’s definitely can freeze you in your tracks, but I know I wanted to complete this challenge so I foraged ahead despite my worries. So, I literally had a blank canvas before me and decided what the hell did I have to lose. I went for it! Without any pencil string or anything to guide me, I drew some familiar tangles free-hand right onto the fabric. I let my hand and my heart be my guide as I drew each pattern. Without any real forethought, I began using very organic style tangles and ended up with a very floral like pattern on my bag. I started with “Tat” with other Tat tangleations and added “Flux” “Scoodle” “Sedgling” to the mix. Overall, I loved how my little bag came out. I am super glad I got over my worries and just went with it. Now it’s time to move onto the next challenge. I like it. I think you did a good job!